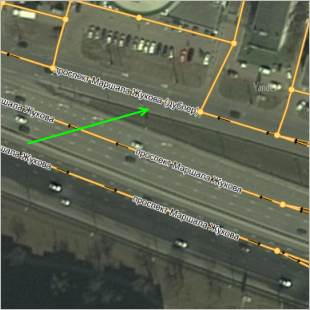 Roads on Yandex Map Editor are composite linear items that are not drawn on the map, but rather compiled from one or more sections of road (each of which is drawn individually and assigned separate attributes). For more information, see section 3.3.2. Rules for adding attributes to sections of road). 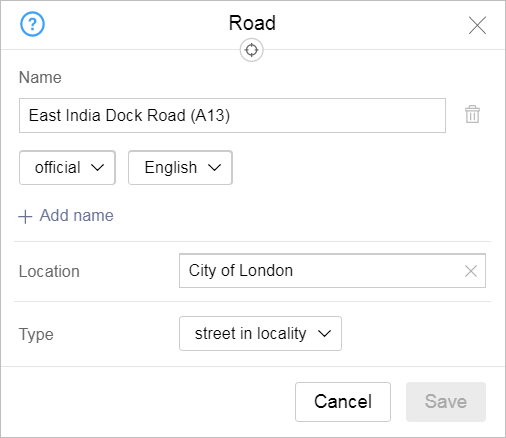 Roads are created as individual items when you fill in the Street attribute panel for the road section (for more information, see section 3.3.2.2. Street). 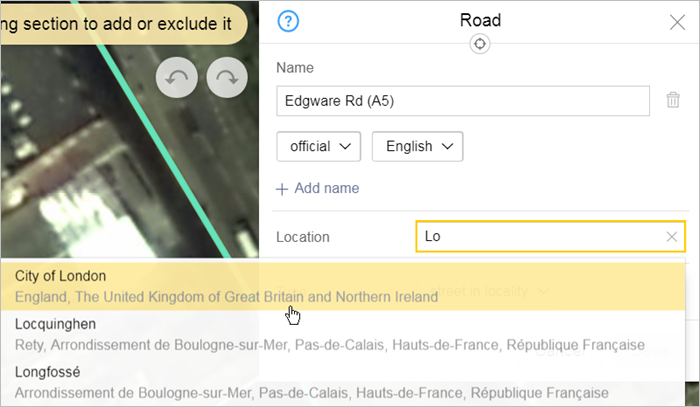 After you create the road, its name will appear as a link in the attribute panel for that road section. Use the panel to add attributes to the road. When you name a road drawn using two lines, the name applies to both lines. Here is a list of attributes for Road items and rules for assigning values to them. International motorways split into sections at state borders and each section belongs exclusively to the country that it runs through. Each piece of road connects to its corresponding first-level (“Country”) administrative district. Interstates (as well as federal routes in Russia, which include city entrances that are part of those routes) and ferry crossings are considered first-level administrative divisions (“Nationwide”). Roads of regional significance and inter-municipal roads are linked to second-level (“Region”) administrative districts rather than to districts or settlements (even if the road is entirely contained within the latter). Streets are linked to localities. If two streets in the same locality have the same name, they are an exception to this rule. 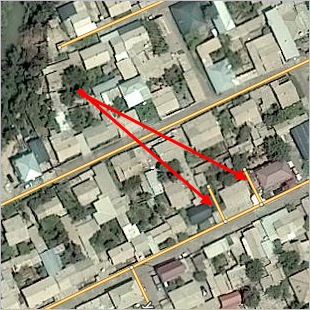 These type of streets are linked to the districts or blocks where they are located (according to official sources). If you can't find information about a street's location in official sources, then link the street to the district or block that it is generally considered to belong to. Streets linked to a locality should be located entirely within the borders of that locality. Ski trails, car-racing tracks, go-cart tracks, motorcycle racing tracks, running tracks, etc. are linked to administrative districts of the “Block” type. To link a named sports track, you should create a separate administrative division of the Block type for the territory of the sports complex. Rules for selecting a type are listed below. Ski trails and major car-racing tracks belong to this type (see point 3.3.2.1.7), running and skiing tracks at stadiums and sports complexes, ski trails within developed areas of localities (see point 3.3.2.1.10). Local laws and regulations or maps (for SNT, KP, parks, cemeteries, etc.). Official names of transcontinental routes are written out completely (with European/Asian capitalized because that is part of the proper name). Do not map numbered highways that are located completely within the territory of a locality. These items are named both as “road” items and as “road structure” items (see also point 3.8.1.2.2). Squares are exclusively labeled as road infrastructure items. Roads within the borders of a given locality, transit roads like the Zapadny Skorostnoi Diametr in St. Petersburg, or roads that unite several streets. The last ones on some sections have official street names in addition to a single arterial road name. 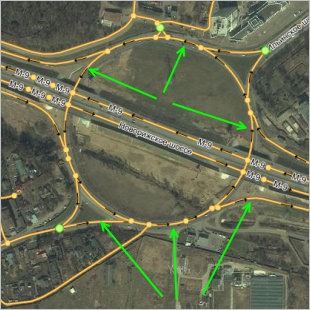 For example, the Third transport ring (TTK) in Moscow, which includes Begovaya St., Sushchyovsky Val and others,The Garden ring, whose sections have names like Bolshaya Sadovaya St., Sadovaya-Karetnaya St. , etc. Roads (usually named highways) that pass through several localities. For example, Mozhayskoye, Borovskoye or Rublyovo-Uspenskoe Highway, etc. For highways that are partly or whole tollways, you should create an additional Road item of that type (see section 3.3.2.12. Toll (paid road sign)). The kilometer number on the highway sign/post indicates that that kilometer ends there. Ring roads in their entirety. For example, the MKAD. A piece of the whole road that corresponds to the kilometer in question, including both road lines. For example, Novocherkasskoe Highway, 1054-th km. Generally, address points are linked to this item. Two sections of road that correspond to the kilometer in question including one line of the road (along the internal and external sides). The names of these roads distinguish between the internal and external side of the ring (using the labels external / internal side or external / internal ring). For example, MKAD, 40th kilometer, external side and MKAD, 40th kilometer, internal side. name for map caption: MKAD, 40th kilometer. Exits from the main road that have their own names or numbers. For example, numbered exits from the MKAD (Exit 24 — exit from Kashirskoye highway). Attribute values must not contradict each other 3.3.2.1. Class and 3.3.2.7. Design features section of road. For example, a “ Numbered highway” “ can not” include sections of Pedestrian and bike paths or a “ Roundabout” design feature. The road's attribute panel will open when you click on the link. The techniques for entering road names are similar to the techniques for entering names for all items on YME. Note. Crossroads and small at-grade junctions with proper names can be drawn as level-6 administrative divisions (Named territories).In addition to using a placemark, you can also represent it using a polygon (see sections 3.2.1.4.5 and 3.2.2.3.6). When you enter road names, follow the rules of grammar for the language you are using. For roads that have the “# kilometer” type, you must enter a name “for the caption” (in addition to the official name). 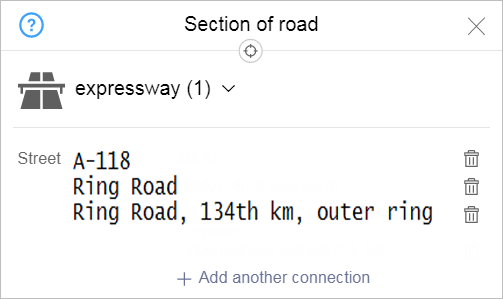 If that road is part of a “Numbered highway” or “Arterial road”, then the caption name for that element uses the “caption name” of the mother road (if this road is not indicated, then use the official name). If the name of such a road includes the number of kilometers written as digits, it is expressed as an ordinal number, that is, using the build-up (hyphen and letter case end). If the official name of a road is М-7 Volga, 817th km, the caption name will be М-7. 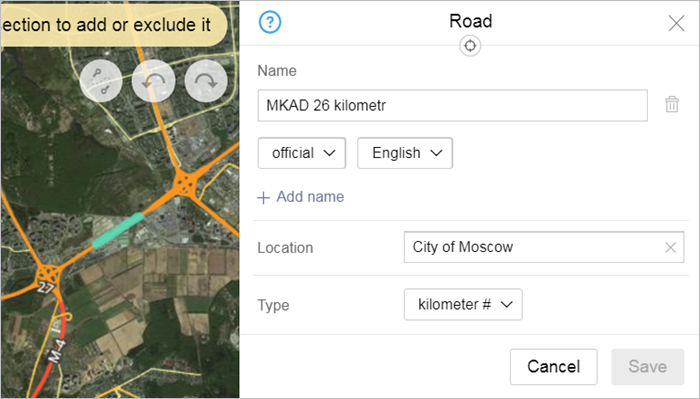 If the official name of a road is MKAD, 73rd km, the caption name will be MKAD (the official name is the Moscow ring road, so you don't need to enter the caption name for it). The “Previously called” field is only used in cases where the name of a road changed in the past two years. If the name changed more than two years ago, enter it in the “Also known as, historical” field. The naming rules are the same for all roads, including those under construction. If a road has a very long name, then enter it as the “Official” name and use the shortened version for the “Caption” (without leaving out any of the main identifying parts of the name). Name for caption on map: Fokin St.
For Russian highways, the number is written using hyphens. For example: M-1 Belarus (not M1 Belarus). These roads are called Numbered highways. Official name — number and proper name, for example М-7 Volga. Name for caption — the number without the proper name (used in the stripe on the map), for example М-7. “ Also known as, historical names” — description of the route that corresponds to official documentation (see point 3.3.3.3.3.5), for example point A - point B. When you enter these types of names, use a hyphen with a space on each side. Highways with a number and no proper name (typically regional highways, for example 17N-515). These roads are called Numbered highways. 515 — the ordinal number for that region. If there are several highways within the region with names like 17N-515, enter the full names as the official names (without spaces), and enter the short names for the captions. Official name — number, for example 17N-515. Don't enter a name for the caption. Also known as, historical names — description of the route that corresponds to official documentation (see point 3.3.3.3.3.5), for example point A - point B. Branches extending from federal highways are marked as items separate from the main course of the road. These roads are called Numbered highways. Official name-route number and description of the branch route, for example M-5, entrance to Saransk. Name for caption — highway number. For example:М-5. Unnumbered highways with their own name are roads (which do not correspond with other roads that are recorded in official documents) with assigned unique names. For example, Mozhayskoye Highway or Chuisky Trakt. These roads are called Named highways. Official name — unique proper name, for example Mozhayskoye Highway. Official name — winter road in Laryak Village, the Ponga-Onega ice crossing. They also include ferry crossings. Their names are picked based on the names for starting and destination points they link, or just the destination point. For example: the Vanino-Kholmsk ferry crossing, ferry crossing To Voznesenye. If a ferry crossing connects two counties, it should consist of two items of the “Named highway” type (each of them based in their corresponding country with a name in that country's language). Due to technical limitations, our staff may edit some of those crossings in a way that contradicts the rules, and then lock them out of any further edits. 3.3.3.3.3.5. Description of the route in accordance with official documents. In Russia, the official documents that describe the route include the list of roads of federal significance and the lists of regional roads (by federal subject). Similar documents have been adopted in other countries. Don't create separate items for sections of an extended named or numbered motorway that corresponds to a public transport route. 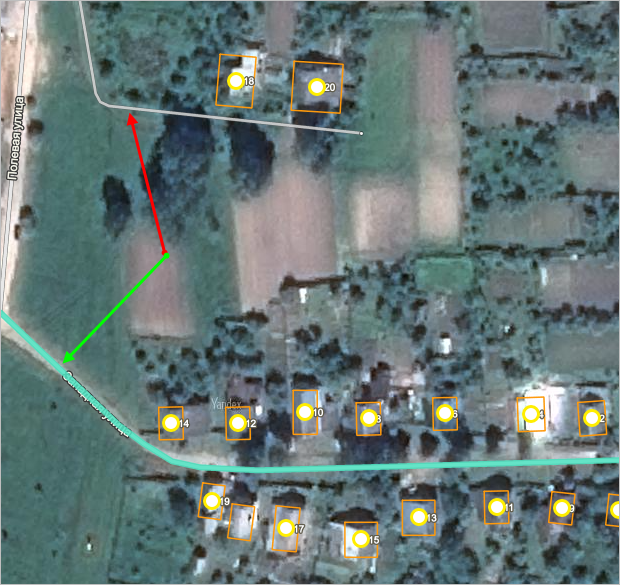 For example, if the official description of a route is Petrovo - Ivanovo, then you can not create separate items for the component roads Petrovo - Sidorovo or Sidorovo-Ivanovo. Such items will be deleted from the map (with the “Petrovo - Ivanovo” road remaining). You can not include a route description in the road name that is not included in official documents. These descriptions (generally they refer to roads leading to concrete items like “dirt road to windmill” or “road to beach”) will be deleted from the map. Shorten long route descriptions (i.e. those that consist of three or more stops) so that you only mention the first and last stops. An exception is for routes with the same starting and ending points that differ by at least one intermediary one. If one of the stops in the route description is another highway, then enter its number in the name even if the highway is described using its beginning and ending stops in official documents. For example, enter names like “Moscow-Yaroslavl - Nikolaevka” as “М-8 - Nikolaevka”. If the route description only includes the ending point of the route, then enter it in the format “Road to Lukyantsevo”. If the route name is written differently in official documents, it can be entered under the “Also known as” type. For example: entrance to Nizovskaya, entrance to Lukyantseva, road from highway M-55 to Lukyantseva etc. If the route description includes not only the proper names of related localities but also their types, then only enter the name in the “Also known as” field. For example: enter the Village of Nikolaevka - Village of Lesnaya - Village of Tikhi as: Nikolaevka - Lesnaya - Tikhi. Enter road numbers that correspond to outdated classification systems (the USSR, RSFSR, Russian Federation classifications that remain in effect until January 1, 2018) in the “also known as, historical” field for the appropriate road. Enter names of ski trails, car-racing tracks, motorcycle tracks, etc. if they are attached to sports complexes. Enter them as “Official” names and indicate the type of item (for example, 5G Highway). You can name pedestrian paths that are only intended for athletic use and do not have proper names. For example: Ski trail. “Do not use” local unofficial (folk) names for these types of items. If a street forms the border between two localities and each side belongs to a different locality, then create two streets and link them accordingly (regardless of how the street is named). Don't enter a caption name on the map. In these cases, the streets can have either the same name or different names. 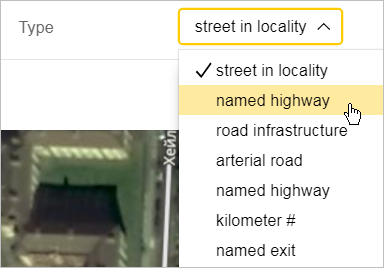 Create a separate item for each street with its own official name, but use the same caption name for both streets. For example, 10th and 11th line of Vasilievsky island (Vasilievsky island). If both streets are linked to the same locality, overlap each other, and only differ by name (for example, Luzhniki St. and Novoluzhnetsky Ln. in Moscow), then each street should be a separate item with its own official name: Don't enter a caption name on the map. 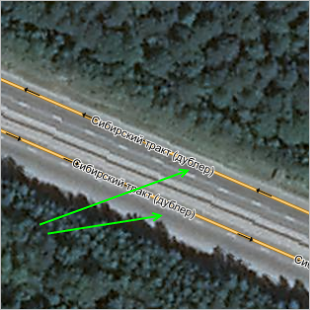 Edit road components the same way that you would with any composite linear map item. 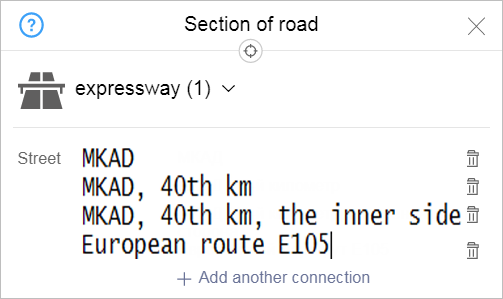 When you edit motorways, you can add sections of road as a group (note: this function is not available for all users). The road only includes sections that are officially components of that road. Passageways within courtyards, dead ends, or passageways between blocks in rural localities are officially not considered parts of roads and are not included in roads on maps. If there is no official information about how a section of road fits into its parent road, then place the road where the majority of addresses linked to it are located. If an address point or small group of them are located at a distance from the main area with residential buildings, then you do not need to specially draw the street up to the buildings. If approximately the same number of address points are located on two streets that run parallel or perpendicular to each other, you should include both sections of road in the street. Streets do not include passageways between the narrow sides of buildings and the courtyards except in cases when the passageway connects pieces of the same street.